Women serving the St Albans Community since 1957! 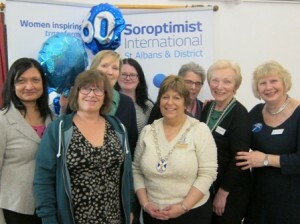 The St Albans and District Soroptimists sparked off their 60th diamond year at their AGM and annual Club birthday pa rty. Pictured here are Club President Denise Powell (centre right), Regional President Pam Robertson (right of Denise), Helen Byrne Membership Officer (far right) – with five of our ten fabulous new Members recruited in the Club year 2015/16 (Alka, Aanda, Allyson, Katherine and Sarah)! 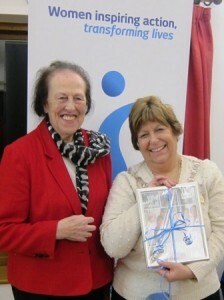 Joan Williams, th e Club’s longest serving Member presented Denise with a framed photo to thank her for being such a terrific President last year. 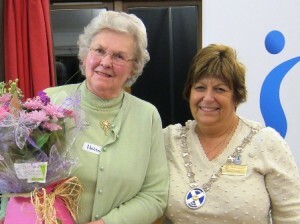 The Club was very sorry that Helen Francis is retiring from Soroptimists and presented her with a bouquet to thank her for 34 years of service and as a gift for her recent diamond wedding anniversary! 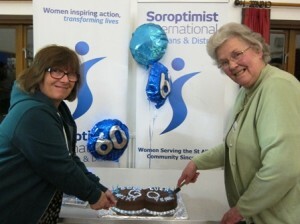 Denise also thanked Helen’s husband for being such a great Soroptimist supporter. Aptly, Amanda and Helen cut the cake – Amanda recently celebrated her “60th” and Helen to celebrate her diamond wedding anniversary.